Create an open and inviting atmosphere in every room of your home when you turn to our showroom for your new hardwood flooring. At our local store, we proudly offer a full selection of options for homeowners looking for something new for their space. Whether you are performing a full remodel or a small upgrade in your residence, we have the perfect materials to meet your needs. From kitchens to bedrooms, our stock of hardwood floors makes a beautiful addition to any room. Visit our showroom today to explore our wide range of product options for homes of any size. Every homeowner dreams of adding a classic style to his or her space. When it comes to a regal look and durable feeling, nothing beats the natural beauty of solid hardwood flooring. Our flooring professionals are proud to present a full inventory of stunning materials for homeowners throughout the region. 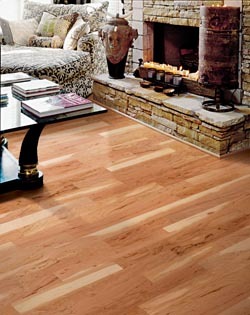 From maple to cherry, our wood floors are available in a number of beautiful styles and colors. We are happy to work with you to find the right flooring to fit your unique décor preferences. Add timeless beauty to every room in your home with a hardwood floor installation. At our local store and flooring showroom, we offer a range of exquisite wood products from some of the most trusted names in the industry. In one visit to our location, you can walk away with the floors of your dreams. From rugged and rustic to clean and classic, you are sure to find the perfect wood solution amongst our impressive selection. Advances in floor manufacturing mean that homeowners have more options to choose from than ever before. In addition to offering traditional styles of solid wood, we also offer prefinished and engineered products. While it may seem difficult to choose the right hardwood flooring for your space, we are here to help you. Our sales professionals meet with you on an individual basis to determine the top product options for your specific needs. From prefinished to engineered varieties, we carry a number of different wood types for you to choose from. Prefinished hardwood flooring means that the planks are already stained and sealed, and ready for installation as soon as they are delivered. Engineered flooring features several layers of composite materials and is topped with a real wood veneer. This affordable option provides the same coveted appearance of a wood floor for a price that fits any budget. After spending your time looking for the perfect hardwood flooring, what is the next step in the process? To ensure a flawless result for your project, we offer our installation services for every client. The exceptional service we provide in the store is extended into the homes of customers with our professional hardwood flooring installation. We maintain an in-house team of technicians that are able to install wood floors in any room. Because we work quickly, yet efficiently, you do not have to disrupt your schedule while you wait for your new floors to be installed. A hardwood flooring installation is a job best left to the professionals. It is the only way to ensure you are protecting your investment in looks and longevity. We are so confident in the abilities of our technicians that we back every completed install with something called the Ultimate Confidence Guarantee. This guarantee means that if you become unsatisfied with your new floors, we will replace them with a comparable product for free. If you are tired of dull and dingy flooring that isn’t improved with cleaning efforts, then it may be time for replacement. We understand that shopping for new flooring often proves to be a challenge. Our team of flooring associates is committed to providing exceptional customer service for everyone who enters our store. It is our mission to partner with you throughout the entire flooring process. This means that we help you select the perfect hardwood floors for your home, as well as provide you with long-lasting hardwood floor installation after purchase. We utilize the buying power of the Flooring America name to offer high-end products at a great value. While we don’t claim to offer discount hardwood flooring, we do boast incredibly reasonable prices on some of the latest floor fashions and styles. When it comes to wood flooring, you won’t find a larger selection in our community. With countless stains, textures, gloss levels, and plank sizes available, you are sure to find a product that meets the needs of your family and household. Imagine coming home to a beautiful set of hardwood floors each day. When you shop at our showroom for an affordable selection of flooring, this vision will be a reality. Our products and services are designed to deliver the look you want throughout your space. From kitchens to bedrooms, hardwood floors add a regal look to any room in a home. Our flooring professionals are here to help make the selection process go as smoothly as possible. During your visit to us, we will speak with you about your wants, needs, and design preferences. We use this information to help you make the right choice for every room. Contact our local showroom to browse our stock of hardwood flooring. We carry a wide range of hardwood floors for homeowners throughout Burlington, Westford, Colchester, Jericho, and Willison, Vermont.